The battle is fought in the mind. The Secret Service call it muscle memory when they react a certain way while protecting the President. They rely on years of training their minds to react in a certain way during a crisis. When the crisis occurs, they respond without conscious effort. 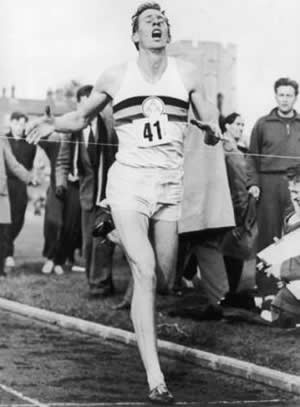 Perhaps the first runner to experiment with this phenomenon was Sir Roger Bannister. He was the first man to run the mile in less than 4 minutes. Most have said Sir Roger’s success came because he, better than anyone, perceived the battle for the 4-minute mile was fought in the mind, not in the body. In spite of my obvious disdain for the animal forms of Kung Fu, I voluntarily attended a 12 Animal Knife Seminar this past Saturday that my Sifu offered to the class. The opportunity to train with the knife offset the fact that we would spend the day performing these dreaded animal forms. Surprisingly, as soon as I, my opponent or both of us had a knife in our hand, the animal forms were no longer the monkey, snake, hawk or eagle. They became the reaction we happened to use to disarm our opponent. It was simply a rehearsed, automatic response to a specific situation. During any given class you will hear Sifu say, “Train your body so that it reacts automatically.” Even in Tai Chi when we are moving ever-so-slowly, he assures us in a crisis our body will react in the way we have trained it to respond…but fast. It happens because it is the brain you have trained, not just the muscles. In class on Saturday, Sifu told us about a Kung Fu student that was unfortunately attacked one night by a man with a knife. The student’s training kicked in and he disarmed his opponent and took the knife. When we disarm our classmates, we immediately hand the knife back to them so we can go through the drill again. After the student disarmed his real opponent, he too handed the knife back to his attacker! “From now on,” Sifu said, “we will take a moment before we surrender our knives in class. “Training the mind is powerful.” he said. Next Post Start Fast, Hang On or Start Slow, Finish Strong?